It's is one thing to complete a project–but seeing your product in action and in its intended environment, raises the bar to a whole different level. 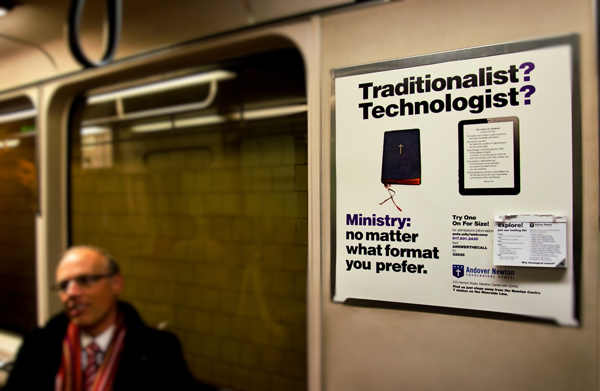 In a recent post, Passengers Encouraged to Tear-Off, Before They Tear Off, we showed examples of a recently designed poster campaign for Andover Newton Theological School. Solid proof that the campaign is working! Through our friends at Andover Newton and the media company, Titan 360, we received a couple of photos showing our work hanging within the subway cars of Boston's subway system. The most exciting piece of the whole experience? Seeing that many of the tear-off cards were missing! – Doug. So I’m sure we all remember the very early days of the twenty-first century, when scores of people were eagerly striving to gain their MBA degrees–hoping for a ‘fast pass’ to excessive wealth and perceived security. Now several years into the current economy’s prolonged pause, people young and old are taking advantage of this time, to reengineer their personal goals–perhaps, seeking something much more spiritually gratifying. Andover Newton Theological School, the nation's oldest theological school and its first graduate institution of any kind, has observed this significant rise in interest and has been actively building programs to meet the needs of individuals–who seek a path to ordained ministry, chaplaincy, campus ministry, nonprofit work, theological education and scholarship–just to name a few. Additionally, ‘ANTS’ is striving to demonstrate the evolution of a ministers’s traditional role. A recent campaign was adorned with the headline, “Think Outside The Pulpit”. This message was created in an effort to reinforce the fact that, ministry, more often than not, now extends well beyond the walls of a traditional church building. A 'hot-off-the-press' Andover Newton project–includes a series of posters–soon to appear on the walls of Boston’s subway (T) stations. Through imagery and text–designed for a quick-footed commuter, the posters introduce the ‘we’re not your grandfather’s minister’ message–as well as very important information about the school itself. Curious passengers are encouraged to ‘tear off’ an information sheet which introduces the school and the many different–full-time, part-time and online courses that this wonderful school has to offer. Please look for the posters in a T station near you. –Doug.